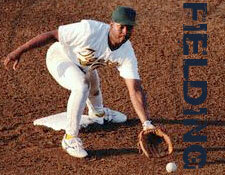 These baseball outfielding drills will focus on making your outfielders well rounded players. These outfielding drills focus on communication, fielding pop-flys, fielding ground balls, fielding short hops and many other outfield situations. This baseball fielding ground balls drill will help develop and perfect infielder's and outfielder's fielding technique and fielding ground balls. This baseball outfield communication drill will help increase communication with outfielders. This drill focuses on fielding pop-fly's and will help develop and perfect the technique when fielding pop-fly's. This baseball infield drill focuses on fielding short-hop ground balls and helps players learn to properly judge short-hoppers. 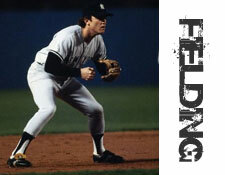 Focuses on fielding for infield players. Helps develop quick, explosive lateral movement while working on proper infield fielding technique. The objective of this outfield and fielding drill is to practice a relay from the outfield to the infield. This drill can be setup into a game to make it more appealing to a younger team. The drill works on the mechanics of throwing to a cut-off man and receiving a throw as the cut-off man.